Maybe you’ve taken an international cruise without a passport and it was smooth sailing all the way. But you might want to consider Earl Wentzel’s troubling tale before booking your next maritime adventure. Wentzel’s case should serve as an eye-opener to anyone considering taking a cruise without a passport. When you cruise without a passport, you’re putting yourself in a precarious position that could cause you to miss your cruise completely — no refund included. Or worse. You could even find yourself stranded in a foreign country. Wentzel planned a Mexican cruise on Carnival’s Splendor for himself, his wife and their adult son and his family. Early in the morning on the day of the cruise, the group took a flight from Minneapolis to Los Angeles. Once in L.A., they would embark on their week-long adventure. All was going well — until it suddenly wasn’t. Panic set in for the family. Wentzel was aware that Carnival’s transfers from the airport to the cruise terminal ended at 2 p.m. But now their flight was scheduled to land after that time. He says when he called Carnival to discuss their flight delay, an agent assured them that they wouldn’t miss the cruise. Mission impossible: Beating the 405! Once the family landed at 2:26 p.m. they quickly gathered their bags and hopped into a taxi. They needed to make it from LAX to the cruise terminal in Long Beach in less than 30 minutes. 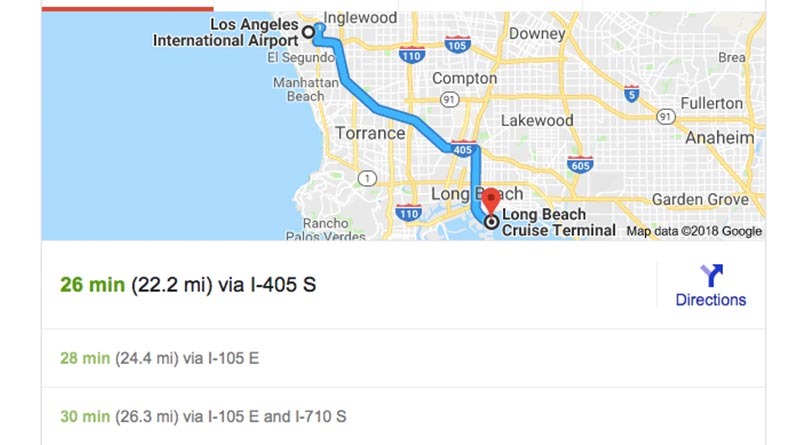 The route from the Los Angeles airport to the Long Beach terminal is 22 miles on the most notoriously congested highway in the United States — the 405. Even if by some miracle the 405 was clear — the possibility of making it to the port by 3 p.m. was unlikely. But anyone who has spent time traversing this highway knows there was zero chance of a traffic-free drive between these two points. But still, Wentzel says that the Carnival phone representatives told him that The Splendor would wait for them. Predictably, the 405 lived up to its well-earned reputation. Wentzel says they arrived at the terminal at 3:37 p.m. The family had missed the cutoff time for boarding. And to add insult to injury, The Splendor was still there, taunting the frustrated travelers. Wentzel found one lone Carnival employee and asked if he could reopen check-in and let them join the cruise. The employee told him that boarding closed one hour before departure. The Department of Homeland Security requires cruise lines to provide a passenger manifest no later than one hour before a cruise departs. This information is provided on Carnival’s website. Unfortunately for Wentzel’s family, there was no way for his family to board the cruise at the time they arrived. Feeling defeated, Wentzel called Carnival again and asked about the options of catching up with The Splendor. There was good news — and then some bad news. Very bad news. The good news: Carnival informed him that the family would be able to catch up with The Splendor in Mazatlán in 2 days. First, they would spend the night in Los Angeles and then fly to Mexico. They would spend one night in a Mexican resort and wait for the arrival of their cruise ship. But then came the very bad news. Wentzel’s son and daughter-in-law did not have passports. There is no way to enter Mexico by air without a passport. And so the option of catching up with the cruise wasn’t available to the couple. What’s the US Passport Card? Closed loop cruises are cruises that begin and end in the same U.S. port. Although it is highly recommended to cruise with a passport, it is not required (yet) on these types of cruises. Many passengers who do not possess a passport, cruise with a passport card or an official birth certificate with a government-issued photo ID. The US Passport card is a small, driver’s license-sized Real ID compliant form of identification. It can be used to enter Canada, Mexico, The Caribbean and Bermuda via land or sea. But it can never be used for an international flight. That’s an essential piece of information for any cruise passenger to consider when deciding on taking a cruise without a passport. And missing your cruise entirely is not the worst thing that could happen. Many travelers are choosing to get both a passport card and a passport book. The reason? The passport card can be used for domestic air travel. And in October 2020 some state-issued driver’s licenses will become unacceptable forms of identification for domestic air travel. You can check the status of your state’s driver’s license Real ID compliance on the Homeland Security’s website. But back to Wentzel’s problem. He and his wife were headed to Mexico. But without a passport, his son and his wife were headed home. Their disappointing tale is one that our advocacy team has heard many times. (No, your baby can’t fly to Mexico without a passport, You can cruise with just a passport card, but…) Unfortunately, there isn’t much we can do for the distressed traveler who doesn’t have the correct travel documents for international travel. So what did Wentzel hope the Elliott Advocacy team could fix here? Why won’t trip insurance cover this missed cruise? When Wentzel arrived home, he filed a trip cancellation claim on behalf of his son. The insurance company reviewed the claim and denied it. There would be no reimbursement for the missed cruise through this policy. According to the information submitted, your delay was less than 3 hours. Your original scheduled arrival time to LAX was 1:10 pm. The actual arrival time to LAX was 2:26 pm. Since you arrived at your destination within three hours of your scheduled arrival time, your delay does not meet the policy provision noted above. We are sorry our decision could not be more favorable. As I’ve mentioned before, I’ve never taken a cruise, so I often consult with my fellow advocate Dwayne Coward on cruise-related cases. Dwayne knows all about cruises and the types of trip insurance policies that cover calamities that a passenger might encounter before and during a cruise. Wentzel’s denial letter seemed unfair to my eyes. His son and daughter-in-law missed the cruise completely. So I asked Dwayne to take a look. Unfortunately, I don’t see any payable benefit in the insurance plan for their circumstances. Since they started the trip, the cancellation coverage would no longer be effective, and the delay due to airline aircraft issues is not covered under Trip Interruption. As for the delay, even if they had been delayed 3 hours, it was not due to a defined Hazard. But there is one little glimmer of hope for the couple. They may be able to receive up to 75% of the cost of the prepaid cruise in a future cruise credit. The terms of the Carnival trip Cancellation protection plan are detailed on its website. If you need to cancel for any reason not listed in the plan — any reason at all — you’ll get 75% back in a Future Cruise Credit Certificate. Wentzel believes that Carnival caused all these problems for his family. When he booked the cruise, he says the Carnival agent selected the chancy flight for him. Even if the flight had not been delayed, it was scheduled for a 1:10 p.m arrival — 10 minutes after the required LAX arrival time listed on Carnival’s website for a 4 p.m. cruise departure. Wentzel says he did ask for a flight that landed on the same day as the cruise, but he had concerns with this schedule. However, with limited daily nonstop flights from Minneapolis to Los Angeles, the Delta flight is what the agent and the family eventually settled on. It’s important to note that he was under no obligation to accept this iffy flight. Our advocacy team always advises that cruisers arrive the day before their scheduled cruise. Without fail, we receive many complaints per month from disappointed travelers who missed their cruise because of a flight delay. And they often assume that the airlines will be responsible for their missed cruise and incidental expenses. When a flight delay ends with a passenger missing their cruise ship, no law or regulation compels the airline to provide any reimbursement. Don’t believe me? Check your airlines’ terms and conditions concerning delays and cancellations. And on its site, The Department of Transportation clarifies that airlines are not responsible for a passenger’s missed cruise or other event after a flight delay or cancellation. Question: Is an airline required to reimburse me for expenses if it cancels my flight and I am forced to miss my cruise, honeymoon, wedding, concert, or other activity? Answer: No. Airlines are not required to reimburse you for any trip costs affected by the canceled flight, such as a prepaid hotel room, a cruise, a vacation, concert or other tickets, or lost wages. And so it’s imperative to give yourself plenty of wiggle room with your flight schedules when you have an important event to attend. The bottom line: If you miss your international cruise and you don’t have a passport, you probably won’t be going anywhere –except back home. Is that a risk you’re willing to take?